I’ve always looked at each project as a puzzle that needed to be solved. Whether it’s a small reach-in done in white melamine, or a full blown walk-in that would make a Hollywood starlet jealous, the process is the same… put everything away, make it look good, and stay on budget. My kids have always joked that I like this job, because it allows me to inflict my OCD onto everyone else. When designing it’s always “function first”. 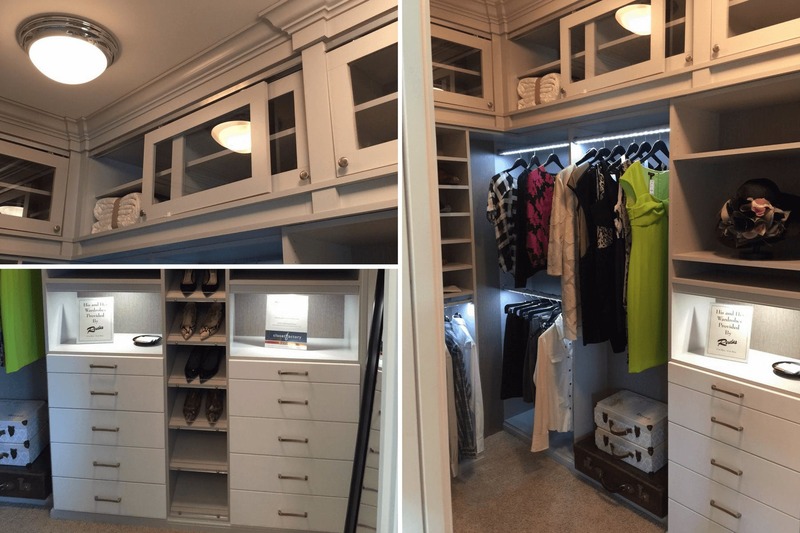 My experience has been that it is easy to take a closet that was designed to work properly and make it look good. 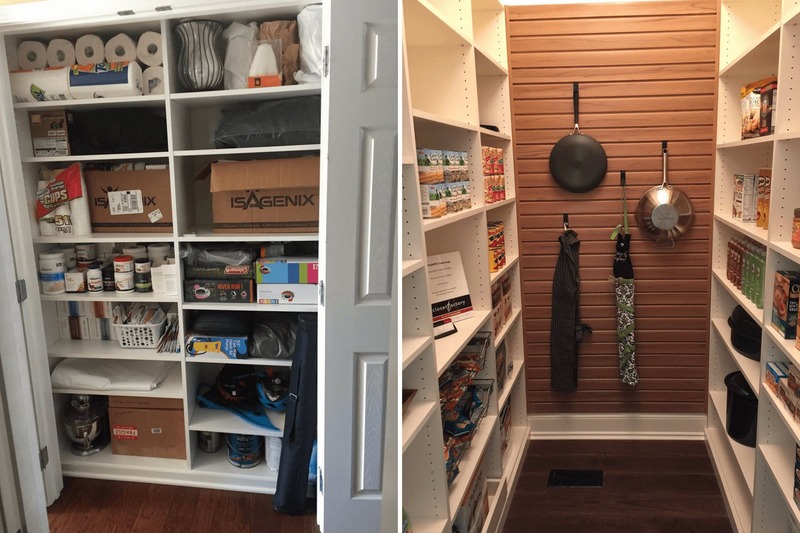 The design needs to start with an inventory of everything that needs to be stored in the given space. If the design does not allow for absolutely everything to be put away, then what’s left over becomes a “pile” that will grow and grow. We can make drawers and shelves whatever size we want but the size I use the most is 24” wide, 16” front to back with a drawer front that is 7 ½ “tall. I have found that this size is optimal, because it’s big enough to hold socks and under ware, but not so big that it becomes a “pit” that you can’t find anything in. The other benefit to this size is that it allows for a shelf that will accept two stacks of neatly folded t-shirts or sweaters. The first thing I think about is: What do we need to store in this space? It’s not enough just to fill the space with shelves, hang and drawers, because if I don’t give you a place to put ALL your things away, I’ve wasted my time and your money, and those who know me know that I don’t waste anything. The solutions: After trying work around the skylights we decided that our best option was to just cover them up. I had plenty of floor space available so I pulled the back of my units 12” away from the back walls which gave me the 84” I needed for double hang and then I covered the last 12” of ceiling slope with a decorative panel that mimicked the Biedermeier furniture that was in the bedroom. The finished project “looks” like the room has an 8’ ceiling height. I always tell my clients that one of my goals is to figure out what their “flavor” is. I ask them to show me pictures of styles and things they like and I start the design conversation with the question: What are you looking for at the end of this project? I’m always looking at the “bones” of the home. 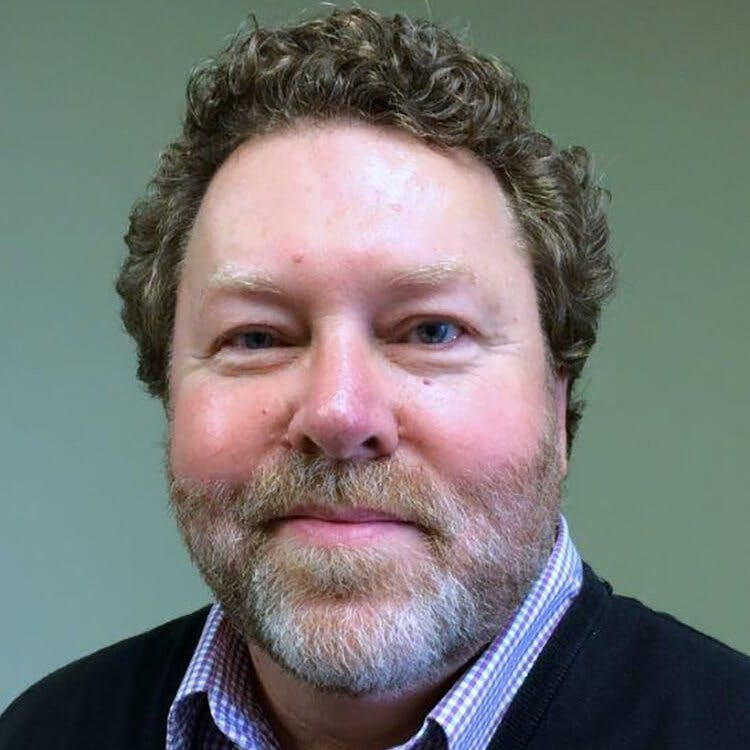 Is it Contemporary, Traditional or Transitional? Then I pay attention to choices the homeowner has made on furniture, art and color schemes. 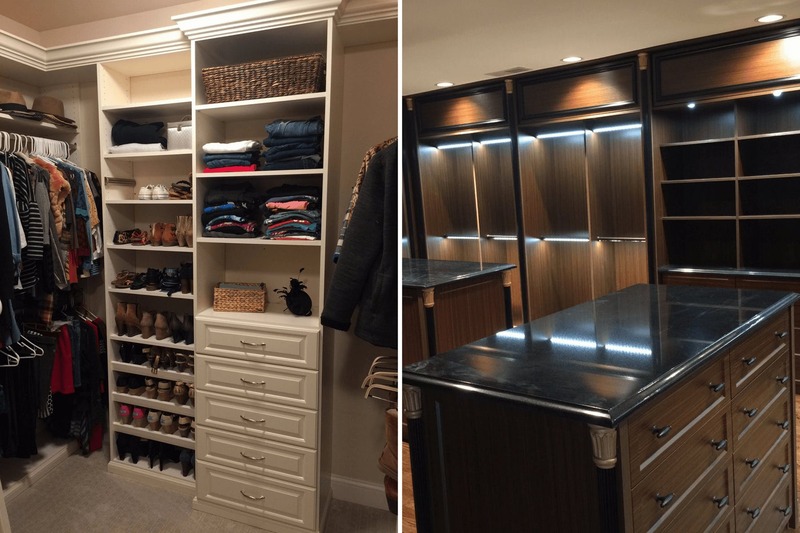 Since we can build our closets in virtually any style, I can then make design suggestions that are not only functional, but have the “look” that the customer wants and are appropriate to the house. Function, function, function! What are you going to do in your home office? Are you a scrapbooker, an accountant, or a computer gamer? 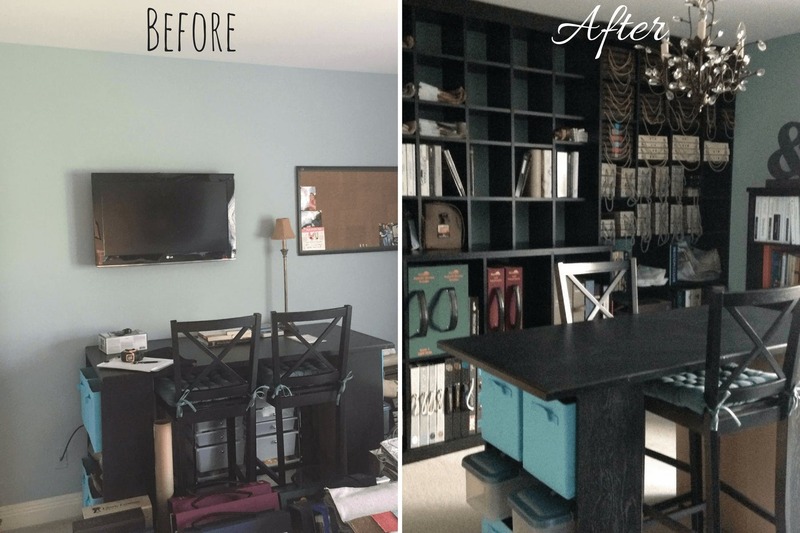 The answer to that question allows me to figure out how to maximize and balance the types of storage needed versus flat work space. Does the space need to double as a guest room? In this case I can integrate a Murphy Bed into the design that allows you to work in a space that does not feel like a bedroom, but your guests can sleep on a real bed when they visit. One thing that can be a storage dilemma are the extra tall boots that women are wearing now. Some of them flop over and some are so tall that they eat up a ton of shoe storage space. A trick I do is to use hangers that have a clip on them. Clip the top of the pair of boots to the hanger and just hang it on a regular short hang rod.